The American Heart Association (AHA) has released a new scientific statement stating that kids shouldn’t have more than two hours of screen time per day. 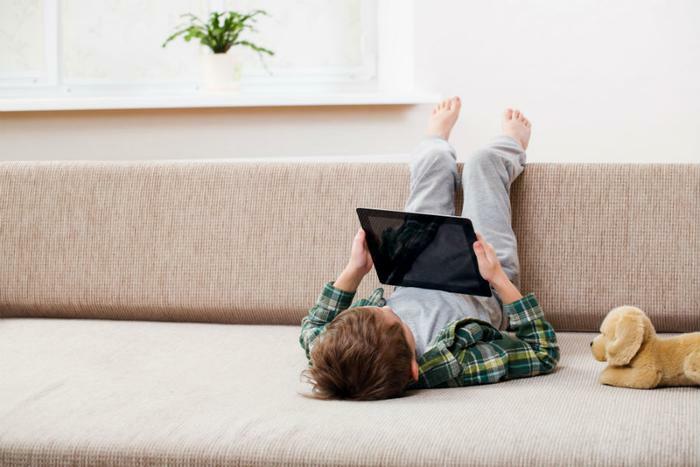 The organization says its primary concern is that too much screen time can lead to obesity in children as a result of the sedentary behavior it can promote. The AHA recommends children get between one to two hours of screen time each day -- far less than the 7 hours per day most children and teens between the ages of 8 to 18 get from smartphones, tablets, and other devices. "Although the mechanisms linking screen time to obesity are not entirely clear, there are real concerns that screens influence eating behaviors, possibly because children ‘tune out’ and don’t notice when they are full when eating in front of a screen," said Tracie Barnett, one of the authors of the statement. Barnett recommends that parents keep screens out of children’s bedrooms due to concerns that too much screen time can affect sleep. Last year, a study found that kids who watched TV or played video games before bed got an average of 30 minutes less sleep than those who did not, while kids who used their smartphone or a computer before bed averaged an hour less sleep than those who did not. Amid fears of technology addition, several tech giants have introduced tools to help users monitor and scale back the amount of time they spend in front of screens. Apple announced in June that it will be releasing software that helps iPhone users monitor how much time they spend on their devices. Google announced on Monday that it will introduce “digital wellbeing” tools -- such as screen time limits and a wind down option to help users spend less time in front of their phones before bed. The AHA’s statement has been published in the journal Circulation.